Excellent work so far. You obviously have a good grasp of the current problems in physics. I suggest that you build your own website and include plenty of graphics to describe your theory. Merely replacing common terms with new ones like ‘ether gradient’ and ‘ether vortex’ doesn’t help me (you may know what they are, but I don’t). Having computer simulations that actually show how gradients and vortexes work will go a long way to explaining your theory. I would also suggest reading Lee Smolin’s book “ The Trouble With Physics” or (at least) check out his article “How far are we from a quantum theory of gravity” - arxiv.org... Section 2 lists all the questions that a new theory should answer. But before anyone will take you seriously, your FM theory MUST have at least one unique prediction that cannot be explained by any other theory (and that can be tested or verified using today’s technology). Otherwise your theory is just another way of looking at things without providing any advantages over current mainstream models. "Recent evidence of the nuclear structure indicated by the Fidler-Morton nuclear model was supported as negative regions around neutrons were shown to exist, and reported in the book the "Fundamentals in nuclear physics." See page 156 of Fundamentals in nuclear physics: from nuclear structure to cosmology - by Jean-Louis Basdevant, James Rich, Michel Spiro. Here is a link to that page:"
The original draft of my book included diagrams and drawings that I did in ink. Not very pretty, and now and then I've looked at computer programs that would make it easier for me to draw some more, but I have not been happy with the results. I'll see what I can do though - either scan the old images, or try something new. I don't have access to all of my older stuff though as that is in another city. I will check out the links you've included. Thanks. "if you are seeking to publish your work, the best way to do that would be to submit your writings to peer-reviewed journals"
"When scientists are specialized it's easy for orthodoxy to develop. The same individuals who formulate orthodoxy theory enforce it by reviewing papers submitted to journals, and grant proposals as well." Lerner himself then states that: "The system of peer review - having all papers and grant proposals controlled by a small group of "leading specialists" - has had a profoundly conservative effect on all branches of science, since theorists in particular are reluctant to admit the truth of papers that contradict their decades of work." "Science advances one funeral at a time." Wow! That is a gold mine of information. I'm not sure where to begin. Also, right now most of my life is dedicated to working, finding more work, a better job, and paying enough of my bills. I'm another victim of the latest economic collapse, and recently of a fire that wiped out my latest best-ever job. Damn - things were really looking good financially - then the fire happened. The job lasted all of a month before the fire resulted in my being out of work again, and forcing me to take a job to survive. And the odd job on the side for extra money. It does not leave me much time for this project, but then if I can get a contract to write the book.... who knows. I scanned a few of the images [really sketches] from the draft of the book from 1990/1993. I just have to figure out the best way to show them on this site, and if I have to link to them instead to maximize their size - so that the text associated with them is readable. Hopefully they'll be up before the weekend, as I'm going away for the weekend. The following is my first test image [sketch] for this topic. I played with the size to ensure the text of the original could still be read. It is currently set at 480 by 628 pixels in dimension. This sketch was used to discuss the topic of photons being polarized, and thus that they must be of a transverse nature versus longitudinal. But I argue that they can be polarizable and still be longitudinal. They simply have to be elliptical in shape to be polarizable. And if you consider that photographic grade polarizing filters still allow 30% of the photons pass through then this means that the angle at which the waves are passing through can be at an angle of 54 degrees out of 180 degrees. Or a passage of 108 degrees out of 360 degrees. If they were physically like the transverse "skinny string" waves often implied in diagrams that means they can be +/- 27 degrees off from being perpendicular and still get through. Not what you would expect given the nature of every drawing that talks about this. Are they fat? Perhaps. Like I'm suggesting, they only need to have a front of material whose overall shape is elliptical in nature. Or click on the link to see it in a window that you can zoom in or out of and see the whole image. Not sure why the cropping occurred in the image above. The following sketch is that of a Two-Photon Physics reaction that shows the formation of a high energy electron-positron pair from two gamma-rays. It does not show them shedding energy to normalize. It does not imply that the gamma-rays have to have this exact appearance, only that one will penetrate the other and trigger the formation. The electron takes on its "vortex" form and the positron ends up becoming a "standing-wave." Pretty much all aspects of physics with respect to matter, and electromagnetism, can be explained or accounted for due to this form for an electron. Charge, electronic shells, magnetism, gravity. Some have implied that somehow positrons must change/be-converted into protons. Or click on the link below to see it in a window that you can zoom in or out of, and see the whole image. 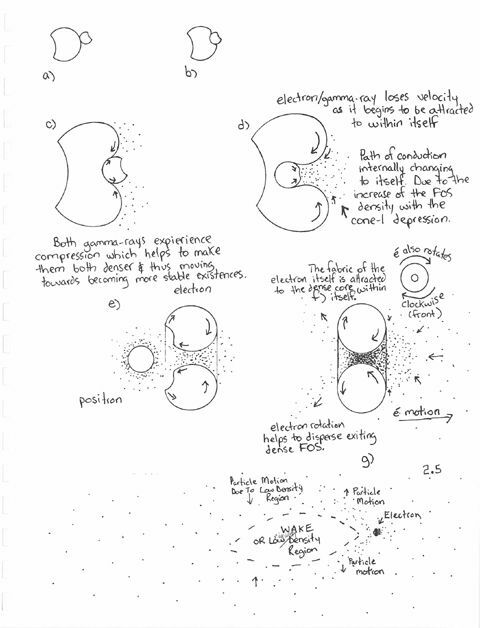 Some twenty years ago, I realized that I should do some computer simulations of these reactions, try and develop the math related to the activity of the electrons around nuclei - and more. I purchased my first computer and a program called Mathematica [similar to MATLAB and Maple], but soon realized that my understanding of the mathematics was inadequate. So, I started to study linear algebra, calculus - and ended up getting side tracked into doing two technology diplomas and an engineering degree. Just wondering, do you hold any credentials or are just a fan of plasma physics?